Sometime in June, my husband and I went on a tour with my parents-in-law. We started the tour at 5AM on the 4th of June and went back to Seoul on the 6th, a holiday. It was a three-day weekend spent travelling by car to several tourist spots in the southwestern area of Korea. That same day, my friend Malou threw a birthday party for her unica hija with tons of Pinoy food… I heard it was a lot of fun and I was so sorry that I wasn’t able to come but I had a great time too. Anyway, our first stop was Seoduksa (a temple) in Chungchungnam-do. Then we proceeded to Ammyeon-do and Byeonsanbando (where the famous drama “Lee Sun Shin” was shot) in Buan where we stayed for a night. The following Sunday, we went to Naesosa (another temple – location for the drama “Damo”) and Seonunsa (yet another temple where parts of the drama “Dae Jang Gum” was shot). In the afternoon, we travelled to Mokpo (a well-known port city) and finally to Boseong. Boseong is located in the province of Jeollanam-do (South Jeolla). An hour and 20 minutes drive from the metropolitan city of Gwangju (famous for the Gwangju uprising) and six hours from Seoul. The city is famous for its green tea plantation. We arrived in Boseong at around 5PM and to our horror, the traffic going to the plantation called “Boseong Green Tea Plantation” was about 12 kilometers long! Tempers were high and we were really tired so we just decided to go back at dawn the following day as we had spent an hour waiting to get closer to the plantation. The “Boseong Tourist Hotel” was fully booked even before 7PM so we had to scour the city for two vacant rooms. We finally found one motel that charges 30,000 KRW per room for an overnight stay. The restaurant in the motel was full when we went down for dinner. 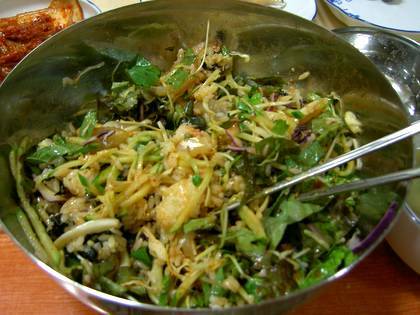 We ordered my favorite “hae-dop-bap”… a kind of “bibimbap” with “sashimi” or raw fish. We woke up on Monday morning at around 4AM but we did not leave the hotel until 5AM. It was foggy and quite dangerous to drive. We noticed that there were already some cars traveling to the vicinity of Boseong green tea plantation. It was about 5 km. from the motel where we spent the night. On the way to the “green tea” hills are towering pine trees, the scent of which were unforgettably refreshing. The sight of the hills were breathtaking! They look so simple on television as well as on pictures but they’re definitely not in actuality. They immediately become one of my favorite destinations in Korea. Some of the areas were foggy, but they only added to the beauty of the plantation. I think we spent almost two hours in the area deeply sighing at the exhilarating views. I lost track of the pictures we took since I was using my digital camera as well as my husband’s film camera. We would have stayed for a few more hours but it we just had to go back to Seoul early to avoid the expected heavy traffic in the afternoon. At the foot of the hills, there is a building where souvenirs are sold as well as a fast food restaurant selling everything with green tea :D. My parents-in-law bought four boxes of “uchon nok cha”. “Uchon nok cha” are the first growth of shoots, gathered before April 20 (a significant date in the Chinese calendar). It is said to be the most expensive kind of green tea here in Korea. I bought four bottles of green tea, cookies and a bag of candy (both flavored with green tea). The cookies and the candies were magnificent. How I wish I bought more! Boseong Green Tea Plantation or “Cha-bat” is a popular shooting location for CF (commercials), dramas and movies. Some scenes of the popular series “Summer Scent” were shot here. Next Post:31 stab wounds and out of danger! i am not korean but i really love korea. hopefully i can go there and learn all of thing about korea. I recognize this in the drama Summer Scent. When I visit Korea someday I will also go to winter sonata and spring waltz beautiful nature locations. if you’re planning to go there, it would be best in spring when they make the first harvest. Oh I envy you so much my dear, I am a huge fan of green tea however have never been lucky enough to visit the places in which it is cultivated..
Nice pictures of the tour. 🙂 I’ve never been to Seoul so they were very interesting for me. Nice Pictures. It looks amazing.